PI and organization: Fabrice Collard (Ocean Data Lab). Co-Is: Lucile Gaultier (Ocean Data Lab), Erwan Hascoët (Ocean Data Lab). Steering committee: Aurélien Ponte (IFREMER), Patrice Klein (IFREMER), Joe LaCasce (Univ. Oslo), Bertrand Chapron (IFREMER), Vladimir Kudriavtsev (Univ. St Petersburg). DIMUP primary objective is to help refine the <O(100) km ocean dynamical range, including the so-called “altimetry gap” and Mesoscale/SubMesocale motions (MSM), and to ensure the developments of practical tools to exploit, interpret, and combine the wealth of present and future satellite observations and in situ data, for the consistent reconstruction of 3D dynamics in the upper oceanic layers. At these scales the extrapolation of high resolution satellite information (e.g. 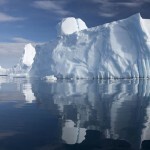 sea level, sea surface temperature or salinity) downward the water column remains an outstanding issue. DIMUP‘s first step was to tackle the latter issue by comparing methods with different mix of statistical and dynamical ingredients and compared performances in a state of the art realistic high-resolution numerical simulation. Sea level was confirmed to be a particularly powerful predictor of interior ocean variability (Fresnay et al. 2018). A second step of the project was to investigate the performance and sensitivity of methods that estimate the ocean vertical velocity field. 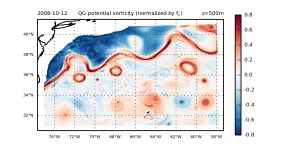 The figures below compares the horizontal map at 500m depth of a dynamical tracer called ‘quasigeostrophic potential vorticity’, which happens to contain essential information describing the ocean state (left figure) with a reconstruction of the same tracer from sea level (left figure). 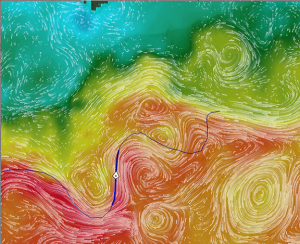 This reconstruction can then be inverted in order to estimate the ocean circulation at depth based on observable surface observation. DIMUP’s third step consists in reconstructing systematically the surface velocity over the Gulf Stream region using GlobCurrent current as a first guess and Microwave Sea Surface temperature observation. A quantitative validation of the reconstructed have been performed using in-situ drifters. Results have shown that Near Real Time GlobCurrent geostrophic and total currents are improved significantly using this method. The figure below compares the first guess velocity (blue streamlines on the left pictures) with the corrected one (white streamlines on the right pictures). On both images, the background represents sea surface temperature from REMSS microwave merged sea surface temperature, a trajectory from a 15m drogued drifteris plotted in blue, the diamond shape pinpoints its position on the current date. The last step of DIMUP was the development of a generic Lagrangian toolbox to evaluate and compare different sources of current, analysis of differences between different products derived from observation and NATL60. Lyapunov exponents (FSLE), Maximum Extend Trajectories (METs) and Lagrangian Averaged Vorticity Deviation (LAVD) diagnostics have been investigated. 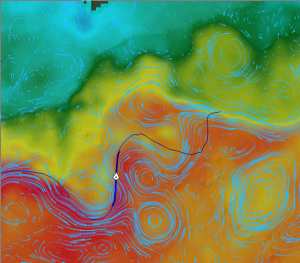 METs derived from the different sources of current have been compared with in-situ drifters and shows interesting results. LAVD have been used to detect eddies, and results have been compared with Okubo-Weiss diagnostics.